Who remembers Mai, the Psychic Girl? It was a manga series written Kazuya Kudo and illustrated by Ryoichi Ikegami, which was originally serialiazed in Weekly Shōnen Sunday from 1985 in Japan. It was then released by Eclipse Comics and Viz International from 1987 in America, first as a biweekly comic, then as four graphic novels (which are pictured below) and finally as a three volume “Perfect Collection”. I first came across MtPG a bit late in the game; I found a back issue of it, completely by accident, in a comic store in the early 90s. Let me tell you, my mind was completely blown that day. Twice, actually. But I’ll save the other mind-blowing experience for another post. The artwork, the story was utterly brilliant! I’d never seen anything like it and yet it was exactly the form of entertainment I had unconsciously been yearning for. 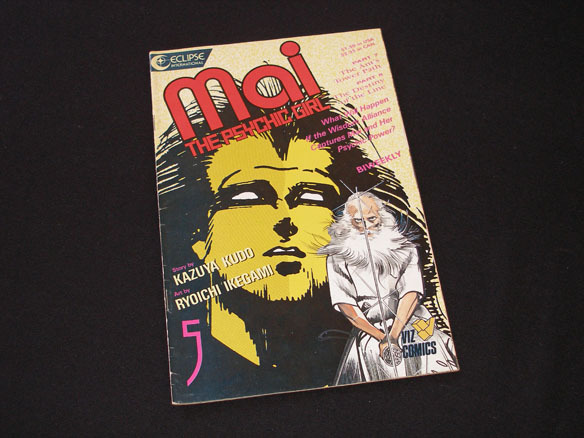 Below you can see the actual comic that I bought on that fateful day: Mai, the Psychic Girl 5. If I had to find a fault in MtPG, it’s that the story at times does lose a bit of direction, but it did have a very long run, so I guess that is not too surprising. And on the whole, it never really stops being a thoroughly entertaining read. On the other hand I think the artwork is flawless. 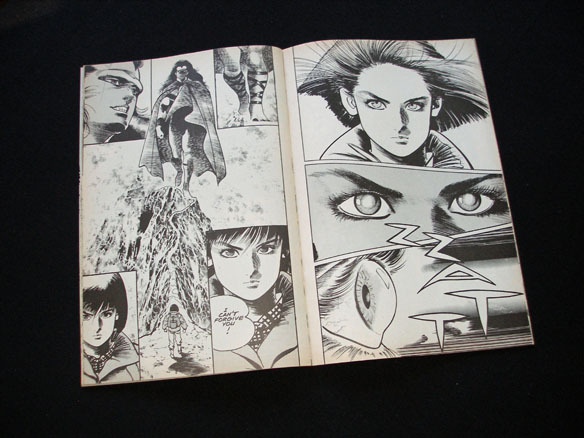 Even if you haven’t heard of MtPG before, you may have seen Ryoichi Ikegami’s artwork in several distinctively adult-oriented yakuza manga series, such Crying Freeman. And if you haven’t, I strongly suggest you do an internet search for it, as Ryoichi Ikegami is an extremely talented artist. To whet your appetite, below are two spreads from Mai, the Psychic Girl 5. 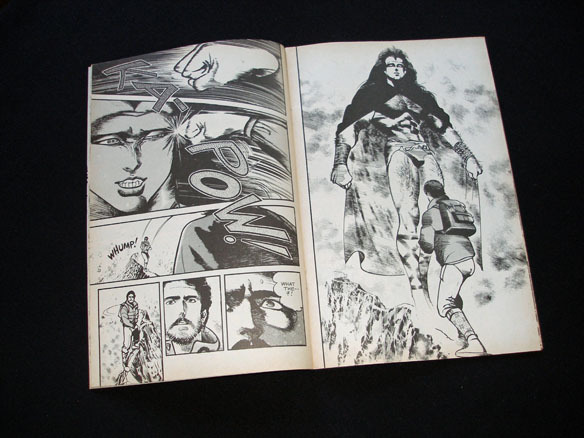 The first is from Part 7 and features Mai’s father and the giant man/monster Tsukiro. The second is from Part 8 and features Mai and Tsukiro. Please note that these pages have been flipped to read from left to right by the publisher. Apart from the English editions I’ve shown above, I also own the first of the three volume Japanese reprint of MtPG from 2003 (which you can see below). 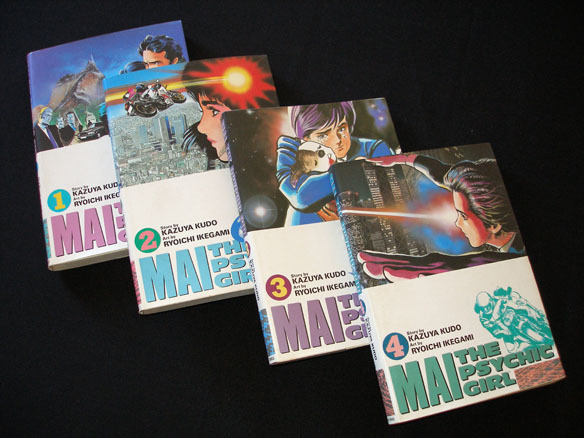 The title in Japanese is simply Mai, but the English title is also shown. I got this edition because I have been wanting to read the story in its original form for a long time, but unfortunately I haven’t gotten around to doing this just yet. And besides, it may be tricky to get a hold of the other two volumes these days. In fact, the same probably goes for the English editions, although there seems to be a healthy amount of listings for MtPG comics on eBay. And who knows, it may even get a reprint sometime in the future. I for one certainly think that this series certainly deserves one. As a side note, there is a Wikipedia entry for MtPG. It has an interesting fact about a proposed film adaptation that I actually recall hearing rumours about. All I can say is that I’m glad it didn’t go ahead! I hope you enjoyed reading this post. Till next time, au revoir, arrivederci and may the force be with you! 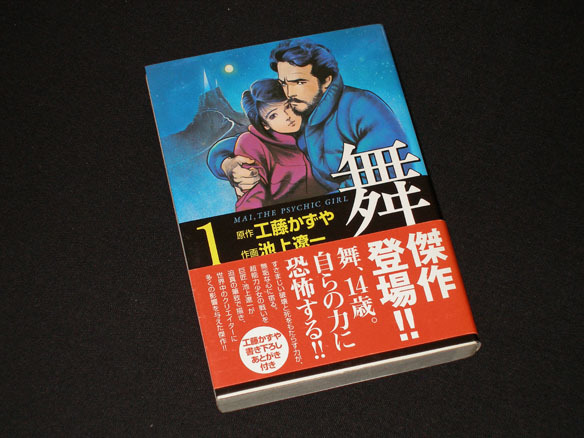 This entry was posted in Classic, English Edition, Manga and tagged Kazuya Kudo, Mai, Mai the Psychic Girl, Ryoichi Ikegami by maruserino. Bookmark the permalink.